30. Wildlife You CANNOT Miss in Madagascar! These travel tips are aimed to help you prepare for an unforgettable journey to this bizarre “Red Island!” Written by an adventurer who’s spent more than a year in Madagascar, it’s the real deal. The 33 recommendations below (in violet) are divided into 11 main sections (in green). This will make it easier for you to find the answers to a specific question. Visit a travel doctor well in advance. There are vaccinations you may need to be administered. These may take weeks to become effective. Refer to your vaccination records. Make sure you are up to date on the following: Typhoid, Hepatitis A, Hepatitis B, Meningitis, Polio, MMR, Tuberculosis (BCG) and/or Tetanus (DTP). You don’t need the Yellow Fever vaccine for Madagascar. However, if you plan to travel in mainland Africa on your way there, you DO need it. You will also need to provide proof of administration upon entering Madagascar if they see African countries stamped into your passport within the past 6 months. You should discuss a Malaria prophylaxis prescription with your doctor. This is especially true if you are travelling between September and May. This is Madagascar’s warmer, rainier season. Take every day – tetracycline antibiotic. Pros: Least expensive, used to treat many bacterial infections (ex: urinary tract infections) and tick-borne infections. A double dose can be used to treat Malaria if someone in your group contracts it. Cons: Side effects may include sensitivity to the sun, increased likelihood of vaginal yeast infections, and weakened gut microbial health. Suggestions: Doxycycline is the prophylaxis I prefer. I just prepare for the side effects. I bring and use plenty of sunscreen and take probiotics to help my gut microbiome recover. Additionally, my doctor writes me a prescription for a burn cream (in case of sunburn), and treatment for yeast infections (Fluconazole). Take every day. It prevents the growth of parasites in red blood cells. Pros: Specific for malaria and also may be used for treatment. Cons: Relatively expensive. Its side effects may include mild stomach pain and diarrhea, headaches, difficulty sleeping, and vivid dreams. Take once a week. It prevents the growth of parasites in red blood cells. Pros: Don’t have to remember to take it every day. Cons: It. Has the most serious side effects. They include dizziness, severe anxiety, violent dreams, paranoia, hallucinations, depression. These nerve and psychiatric effects can sometimes last long after you stop the medication. Insect repellents. In addition to long pants/sleeves, they are the obvious methods of limiting mosquito bites. But they also help prevent flea bites. The bubonic plague is still present in Madagascar. It’s seasonal and rare but is transmitted through flea bites. You should have antibiotics, such as Ciprofloxacin. It will be useful in the event that you get a bacterial infection. If your burps begin smelling like sulphur and rotten eggs, you likely contracted Giardia parasites. Otherwise known as traveller’s diarrhea from contaminated water or food. Acquiring a Flagyl (metronidazole) prescription and taking this treatment once the burps start can prevent Giardia from becoming much of a problem. Useful over-the-counter medications – antibacterial ointment (ex: Neosporin / bacitracin), Anti-diarrheal drugs (ex: Imodium A-D / loperamide), allergy medication (ex: Benadryl), anti-inflammatory drugs / pain relievers (ex: Ibuprofen), antacids (ex: TUMS or Pepto-Bismol) and rehydration tablets. Most cities will have pharmacies, but drug names and doses will likely be in French. It’s much easier to bring your own. You can never bring too much hand sanitizer! Sometimes there won’t be soap available. Or you may make a bathroom stop on the side of the road. I also suggest rolls of toilet paper for the car. Our bodies aren’t familiar with the microbes in Madagascar. That makes it easier for us to get sick if we don’t remain mindful. Pack sunscreen and bug spray but check the ingredients list for harmful chemicals. If you’re planning to swim or snorkel in the ocean, please bring waterproof and “reef-safe” sunscreens that don’t include oxybenzone, butylparaben, or octinoxate that can bleach the corals! Menstrual supplies are limited and expensive in Madagascar. Women should bring their own. Invest in travel insurance. Be sure that it doesn’t just cover cancelled flights, lost or stolen items, and unexpected medical expenses. But also includes emergency medical evacuation. Madagascar’s road conditions are poor. And the health care isn’t generally what Westerners are accustomed to. Typically, being medevacked is your best option if it’s something serious. If travelling from the United States: Air France and South African Air are usually the best airlines to limit the number of layovers. However, I have also used Etihad Airways, Turkish Air, and Ethiopian Air. They typically cost significantly less money. However, expect multiple and longer layovers. Check out Skyscanner to compare prices. You will more than likely fly into Ivato Airport (TNR). It’s located 20 km north of the capital, Antananarivo (Tana). Air Madagascar is the domestic airline. It can save you a lot of driving time for long distance, internal travel. If you don’t want to fuss with the scheduling and frequent discomfort of public transportation, it’s easy to hire a driver and guide for your entire stay. I don’t suggest driving yourself. However, if you have an International Driver’s License and nerves of steel, it’s possible to rent a car. You will not need a 4WD vehicle if you are going south on RN7. However, you will need a 4 wheel drive for travelling west on RN5 and north. Make playlists, download podcasts, charge your Kindle, and be ready to spend a lot of time in the car. Even though Madagascar is almost twice the size of the UK, it has only 1% of the paved road length that the UK has. Bring motion sickness medication, such as Dramamine (dimenhydrinate), if you have even the slightest tendency to get car sick! The roads can be quite twisty and bumpy. It’s not advisable to travel at night. Many drivers will refuse to continue much past sunset. Listen to your drivers. Bandits only strike at night for the most part. Hired Taxi – like most cities across the globe, there will always be a taxi cab eager to assist you. The fare is negotiable and you should haggle. The taxi drivers are known to charge tourists highly inflated rates. Taxi-Brousse are large vans with designated routes to almost anywhere in the country. They are the least expensive method of getting around. However, they generally aren’t comfortable, efficient, or particularly safe. It’s not uncommon to end up with a child or chicken in your lap. And if you’re carrying anything larger than a backpack, it will be tied to the roof. Taxi-Be are almost identical to taxi-brousse, except taxi-be is the term used for the organized minibusses within major cities. Whereas taxi-brousse are generally used for travel between cities. Cotisse – a transport company with minibusses similar to taxi-brousse. However, it’s higher end and much more comfortable. They always leave when scheduled instead of waiting until the car is full and packed. They also drive more carefully. And if you’re really lucky, you can connect to free WiFi. Trains – there are over 1000 km of railroads tracks in the RNCFM Malagasy rail system. But it’s primarily used to transport cargo. There are only 6 routes with passenger trains. While travelling by train in Madagascar is a lovely way to see the country, they run notoriously late. Cyclo-Pousse – a covered rickshaw cart fastened to a bicycle. They’re used in most major cities (though, not the capital). Pay the bike ‘driver’ a small fare (Ar 5000 or less), and they’ll bring you to your destination. With frequent traffic jams in major cities, they are often faster than a car. Tuk-Tuk – motorized three-wheeled rickshaws that hold three people and are almost always yellow. It is usually a flat fare, but the prices are quite reasonable (similar to cyclo-pousse). Charette – a wooden cart pulled by zebu cattle is the most common way of getting around in rural areas. There is no set price. Haggle for what you are willing to pay. In some coastal areas, especially the southwest and the northeast, the primary means of transportation is by cargo boats. Avoid them during rough seas and cyclone season (Jan-Mar). Dugout canoes called pirogues are common for crossing rivers or for getting to the best snorkelling areas. Please remember to be flexible, patient, and respectful to your drivers and other Malagasy people you encounter. Most Malagasy don’t like rushing. And in a country with limited resources, it’s easier to just go with the flow. The Malagasy have a saying, “Mora Mora,” which translates to slow living and no worries. They are going to be relaxed, and I promise that you will have much more fun if you relax too! Lifestraw Go water filter bottles are legitimately a life saver. Especially if you are environmentally conscious or an avid hiker. If you don’t want to constantly be buying water bottles, you can fill your LifeStraw up with unfiltered tap water. Or if you’re on the trails … anywhere!This allows you to avoid starting hikes with 3+ litres of heavy water. I have even filled my Lifestraw in a warm and murky rice paddy during desperate times. I never felt any signs of sickness. Lifestraws are relatively prone to leaking and should be kept upright. But they are 100% worth the small investment! Avoid ice in your drinks unless you can guarantee that it was made with filtered water. Sometimes there isn’t much variety in the cuisine. On the plus side, meals come at a fantastic value! The capital – Antananarivo – and touristy areas, especially along the coasts, will have more to offer. I’ve had some of the best meals of my life in Madagascar. Just be flexible during monotonous periods. Like with ice, avoid uncooked vegetables unless you’re certain they were washed with filtered water. I encourage everyone to try the “Ranonapango.” It’s essentially burnt rice tea. Although it’s not actual tea, it’s comforting and reminds me of popcorn… Rice is the cornerstone of the Malagasy diet. It’s the base of every meal, including breakfast. “Toka-gasy” is a Malagasy moonshine made with sugar cane. You could be offered a drink by a village King. It’s considered rude not to accept. However, do be aware that it is technically illegal. Though, not enforced because the alcohol content cannot be controlled. Some batches seem weak and others will knock you on your feet! It’s a good idea to bring protein bars. Especially if you have dietary restrictions (such as vegetarian or vegan) and/or plan on long hikes. Here’s some additional info on local food and what to expect. Brush up on your French. Madagascar was once a French colony. French is still one of the official languages. Many signs and restaurant menus will be in French. Most prices will be told to you in French. It will be beneficial to at least learn your numbers. Try learning simple Malagasy phrases. The locals sincerely appreciate when you invest time and interest in their native language. For starters, “Salama” means hello. “Veloma” means goodbye! Malagasy people are more inclined to be open and friendly with people who aren’t from France. So don’t feel like you should become fluent in French! There are a few Malagasy/English handbooks available if you’re interested in languages. Malagasy is a tough language to learn until you’re immersed, especially the pronunciations! This short video of a few keywords in Malagasy with pronunciations will get you started. The largest bill – Ar 20,000 – is equivalent to less than 6 USD. However, it’s considered substantial to most Malagasy. You’ll want a safe money bag or belt because you will be carrying many more bills than you are used to. The Ariary notes changed in 2017. Therefore, there are two designs for every bill, excluding the Ar 20,000. The Ar10,000 was the largest bill until 2017. To exchange your currency into Ariary, bring relatively large and new bills. They shouldn’t be older than 2010. It will be easiest for you to exchange your currency right at the airport. That way you’ll avoid the long lines and limited hours of banks. I find this to be the easiest way to access money. Credit and Debit cards. Some places in cities accept cards, but only VISA is reliable. Other networks like MasterCard and AmEx often won’t work. Honestly, it is best to carry cash! ATMs are only available in big cities. And there’s a limit to how much you can take out. Also, it’s not uncommon for ATMs to be out of order or empty. You will have people begging you for money. Especially children, mothers, the elderly, and the disabled. I would be lying if I said it wasn’t difficult to witness. But it’s unavoidable, especially in big cities. Everyone is entitled to their own opinions on how to handle these situations. But do acknowledge that your actions will impact more than just the beggar. Begging is not a sustainable way to make a living. If you decide to give, be tactful about it. Don’t flash large wads of cash. And understand that successful beggars often return with friends. To avoid being surrounded and causing a scene, wait until you are about to get back into your vehicle. I generally only give to those performing – sometimes people sing, dance, or play an instrument. And I never give to overly pushy people. I don’t want them thinking that’s the way they should approach all tourists. When giving money, I keep it discrete and politely urge them to use it for food. Tips are generally well received and deeply appreciated. They’re sometimes it’s your biggest daily expenditures. Especially if you’re on a guided tour where most expenses are paid for ahead of time. When you can break large bills into smaller bills for tipping. Keep these tips in a separate pocket from the majority of your cash. To offer you a perspective, Malagasy people who are fortunate enough to be employed typically don’t make more than Ar 200,000 (~$56 USD) a month. If you want to keep your tips within the average range of other tourists, roughly follow the guide below. However, you are welcome to give more. Especially with guides and drivers. But only if they exceeded your expectations. Taxis and bars: Not expected or small bills. Porters: small bills, likely not over Ar 1000. Restaurants: 5% of the bill or less. Guides: 10% of the fee. Personal Drivers: Ar 5000 – Ar 20000 a day. Bring more warm clothes than you would think necessary. This includes thermals, hat, gloves, and fleece. 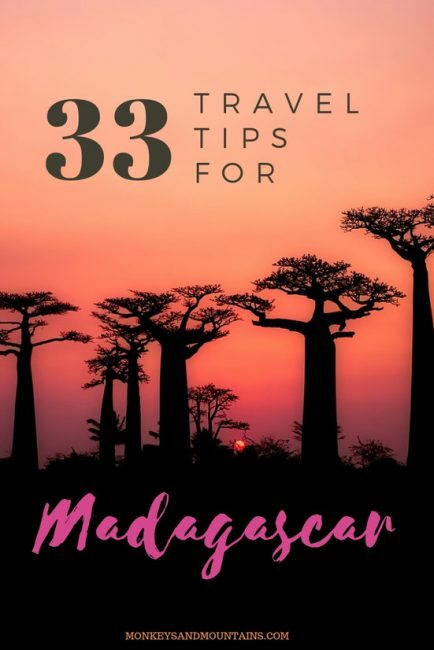 Especially if you are travelling during Madagascar’s winter months (May – September). However, the climate throughout Madagascar changes rapidly. While the cool rainforest fog may send shivers down your spine in the morning, you can jump in the car and find yourself in a desert ecosystem by late afternoon. Therefore, you will want to pack a variety of clothing. Be sure to bring shorts, T-shirts, and durable sandals. If you plan on hiking, you should pack quick-drying field pants, sturdy hiking boots, wool socks, a baseball cap, and a rain jacket. While hiking in rainforests, I advise tucking your pants into your socks and your shirt into your pants to minimize leech bites. Leeches don’t transmit diseases, their bites don’t hurt, and they only remain attached for about half an hour. However, they do have an anticoagulant in their saliva. This causes you to continue bleeding even after they drop off. And these bites can itch worse than mosquito bites. Take precautions but don’t panic if you get a leech. I also recommend a substantial daypack with a supportive waist belt and chest strap. This could double as your carry-on luggage for the flight! Don’t forget bathing suits! Beaches aren’t the only places to swim; some parks have natural swimming holes you can hike to. Your passport cannot expire within 6 months of entry and must have at least 3 blank pages. They are strict about this! Carry your immunization records. They may not be requested if you haven’t been in countries with Yellow Fever. If you’re travelling with a large group, it’s beneficial to obtain your Madagascar VISA within your home country. Otherwise, it’s easy to purchase a tourist VISA upon arrival at the airport for 30, 60, or 90 days. I prefer to have paper photocopies of my passport and tourist Visa. The police will occasionally ask to see your passport, especially in cities and on the road, but I don’t like carrying it wherever I go. Bring European plug adaptors if necessary: 220 Volt, 50Hz AC (Two circular metal pins). Charged power banks are invaluable, especially considering the amount of travel time. If you need your phone to stay alive for the entire day, I would bring a power bank or two. Pack binoculars for lemur and bird watching! If you’re concerned about them occupying souvenir space in your suitcase, donate them to a deserving park guide near the end of your journey. Malagasy guides are often in need of functioning binoculars. Bring a bright headlamp and/or flashlight for night hikes. There are nocturnal lemurs, chameleons, frogs, snakes, geckos and so many other creatures you don’t want to miss! Wristwatches are convenient for checking the time. I t might not always be a good time to pull out your phone. All sizes of Ziplock bags are precious. Smaller bags can organize your medications and chargers; medium bags can keep your electronics and books dry; large bags are perfect for wet or dirty laundry. I recommend silica gel packets and dry bags for your electronics and camera if you’re spending an extended time in humid, rainforest environments. Remember the items mentioned in previous sections: medications, hand sanitizer, sunscreen, LifeStraw water bottle, protein bars, bills to exchange, designated money bag, VISA credit/debit cards, etc. Most hotels have complimentary WiFi. However, even luxury hotels don’t always have internet or outlets in individual rooms/bungalows. Sometimes you have to sit in the reception area for internet access and charging. WiFi is available in some restaurants, but you will need to ask for the password. If you have an unlocked GSM cellphone, you may want to buy a local SIM card (Airtel, Orange, or Telma) and a 3G package. You can do this at the airport. If you don’t want to purchase a plan, you can buy phone credit at virtually any shop. Avoid pointing with only your index finger extended. While it’s not considered offensive everywhere in Madagascar, it’s better to be safe than sorry. Pointing with your index finger is considered a “fady” or taboo in many regions of Madagascar. Especially when pointing directly at a tomb or grave. You can either gesture with your whole hand open, or bend your finger as you point. It is expected to haggle prices unless the price is already established, such as in tourist shops, restaurants, and hotels. It’s part of the culture. It’s respectful to dress fairly modestly. You’ll see everything in tourist areas. However, I personally avoid low cut tops, short skirts and shorts. And I only wear one-piece swimsuits. While difficult to ignore their puppy-dog stares, don’t feed street dogs. 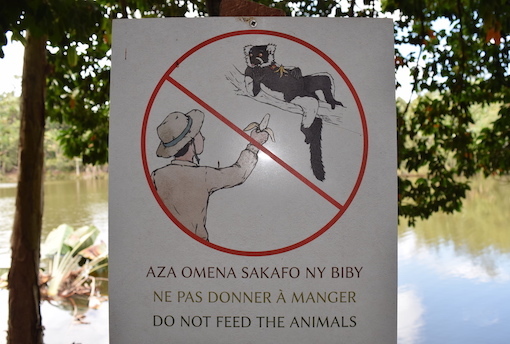 Malagasy people can view it as highly offensive that you took the time and money to feed a dog, but not their family. Most Malagasy actively avoid confrontation, especially with foreigners. Don’t take advantage of this. If you anticipate any village visits, a gift that would be appreciated by everyone is a high-quality soccer ball. I always bring several deflated soccer balls and an air pump from the States. You’ll probably become close with your driver and guide. In addition to a tip, you may want to thank them with foreign gifts. A T-shirt representing your city or country, candy from abroad, or something else they wouldn’t find in Madagascar are the most cherished gifts. If you have a DSLR camera, keep is safe, but don’t be afraid to bring it. There are countless sites and creatures to document that small cameras and phones just can’t capture. Keep all valuables close, especially in big cities like the capital of Antananarivo (Tana). I wouldn’t worry about being attacked. However, there are some skilled pick-pocketers. They can swipe your cash, phone, or other items without you even noticing. Just as you would back home, ask before taking someone’s picture. If you don’t speak French, saying “Sary?” (pronounced similarly to the English, “sorry”) – which means “Picture?” in Malagasy, should sufficiently get the point across. Adults will occasionally wave you off, but kids love to pose. You should show them their picture. But remember to wipe down your camera with a disinfectant afterward. The kids may excitedly grab your camera for a closer look with their cute, but dirty little hands. NEVER pay to take pictures with wildlife kept at restaurants or hotels. Paying for these photos encourages the illegal and devastating pet trade. One of the reasons lemurs are endangered. Many of these animals, especially lemurs, don’t survive these conditions. If they don’t die from a poor diet, they may be killed when they display aggression as they become sexually mature. The “Magic of Madagascar Ecotour” will take you to one of the only rescue centers in Madagascar that confiscates pet lemurs and teaches them how to survive the wild. Aim for sustainable gifts that don’t negatively impact wildlife or people while simultaneously expressing Malagasy culture. My main suggestions include… hand-dyed and spun silk scarves woven from sustainably farmed silk, items made out of recycled aluminum, and art constructed from repurposed zebu horns. RN7 is your best friend. This route starts at the capital and works its way south, then slowly west. It is accessible year-round and brings you through every incredible ecosystem Madagascar has to offer! That’s the route that we take on our Ecotour through Madagascar from July 1st – 12th, 2019! RN5 takes you west to see the “Alley of Baobabs” or possibly even the limestone forest of Tsingy! This road is more difficult to navigate. It’s comical that it can even be considered a national route. The north is also beautiful, but like the west, the roads are very poor, especially as you work your way west. There are stunning places that are easiest to fly to, such as the rainforest peninsula of Masoala and the island of scuba-divers dreams – Nosy Be. Even if you’re travelling to Madagascar for their birds, their plants, or their reptiles/amphibians, please also make an effort to SEE THE LEMURS! Lemurs are the most endangered group of mammals on Earth. You can only observe them in Madagascar. Ecotourism is arguably the best way to show Malagasy people that their lemurs and forests are worth more alive than dead. Contributing to that movement makes a bigger difference than you can imagine. “The Magic of Madagascar Ecotour” brings you to the largest species of lemur (indri) and the smallest lemur (mouse lemur), with many lemur species and sizes in between! If you are keen to learn more about the creatures and culture before going or booking a ticket to Madagascar, I recommend either of the following films: Planet Earth II (on Netflix) and Island of Lemurs: Madagascar (IMAX). Additionally, I recommend the following books: For the Love of Lemurs (Patricia Wright); Thank You, Madagascar (Alison Jolly); The Aye-Aye and I (Gerald Durrell); and Madagascar – The Eighth Continent (Peter Tyson). There are good field guides available for most taxonomic groups in Madagascar. I have personally had the best luck with Lemurs of Madagascar: Third Edition and Birds of Madagascar and the Indian Ocean Islands. Note: if you can’t find that check out Lemurs of Madagascar: Tropical Field Guide Series. For travel guides, the Bradt Guides are probably the best guide I have come across. The author has been travelling to Madagascar for over 30 years! The Lonely Planet – Madagascar: 8th Edition is also quite thorough. While this article provides a comprehensive list, you can’t fit everything into a single post! I recommend perusing additional online resources that can provide even more information about Madagascar. Be sure to check out 28 Interesting Facts About Madagascar! Continue researching and reading! The more you know, the better you can prepare for culture shock. And the more you will appreciate all the sights, sounds, smells, and tastes of Madagascar! Alicia Lamb is a PhD student in her home state of New York, studying Biosciences at Clarkson University. Her research focuses on road ecology management and its impact on wildlife in Madagascar. She has previously conducted research on lemurs, including the Milne-Edwards’ sifaka and a ‘new’ species of nocturnal sportive lemur. She held various educational positions in Madagascar, including National Geographic Student Expeditions leader and Stony Brook University study abroad TA. She has been to Madagascar four times and cumulatively for over a years’ time. She even brought her Malagasy dog halfway across the world with her; that once mangy beach pup now can’t get enough of the northern NY snow! In short, Alicia dreamed of going to Madagascar from the time she was a child, she is grateful for every day she has spent there, and she aspires to continue working on sustainable and holistic conservation projects in Madagascar for the rest of her life.